The lifting of the US crude oil export ban in late 2015 has resulted in a growing role for US exporters in global markets. 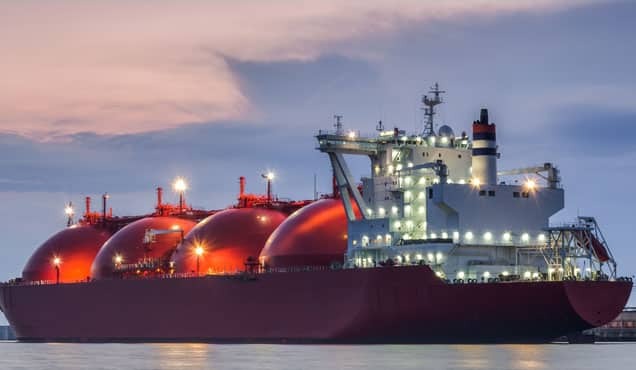 The light crudes, condensates, and natural gas liquids (NGLs) produced with unconven-tional development techniques have saturated US markets, but they are well-suited for growing markets in Asia and elsewhere. 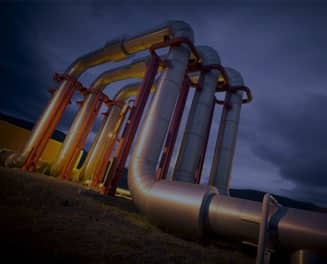 At the same time, imports of heavy sour crudes into the US have remained steady, with growing Canadian Oil Sands production finding a ready home. 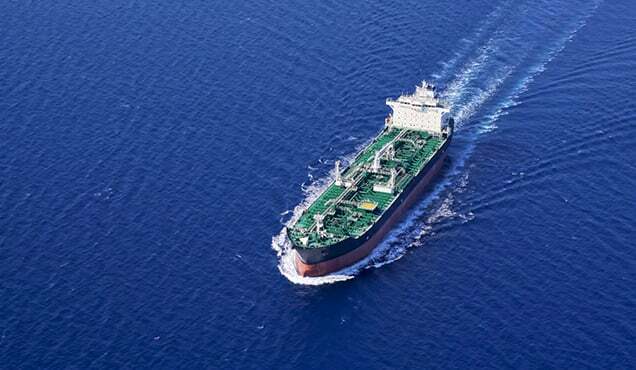 This US "quality arbitrage" - exporting light sweet crudes while importing heavy sour crudes - creates a new dynamic in global crude markets, with implications for both refining and petrochemical operations. The oil price decline that began in late 2014 was due in part to the rapid expansion of US unconventional production. In response to sustained $100+ per barrel crude oil prices and technological innovation, US producers had unlocked the secrets of shale oil (see Figure 1). 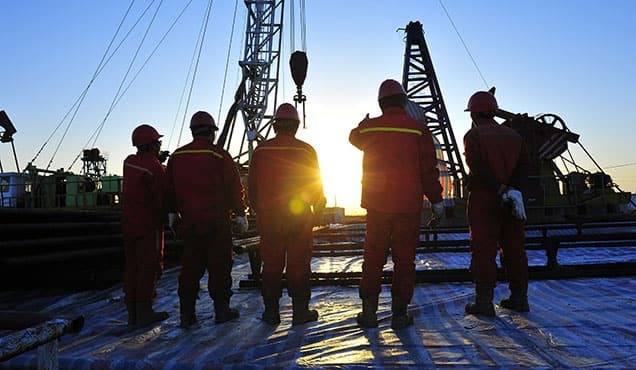 The shale revolution raised production from 5.6 to 8.8 million barrels per day (b/d) over four years. However, the 2014 price collapse was widely viewed as the beginning of the end for US unconventionals. The rig count dropped and production slumped from its April 2015 peak of 9.6 million b/d to 8.6 million b/d in September 2016. Austerity forced producers and service providers to sharply reduce costs, with breakeven prices in key basins falling from the $70-80 per barrel range in early 2014 to $30-40 by the end of 2017. As costs fell, unconventionals became economic at prices in the $45-55 range, and production responded. US crude production grew to 10.5 million b/d by March 2018, with recent weekly estimates approaching 11 million b/d. 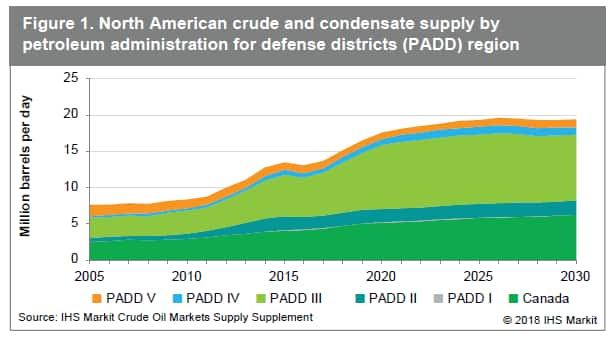 Industry concerns are now focused on the capability to transport growing production from the Permian and elsewhere. 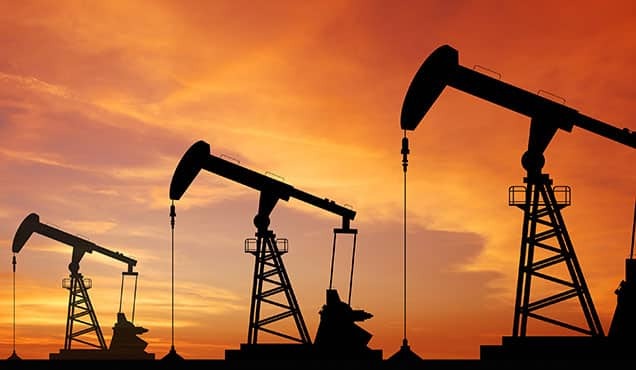 The quality of unconventional production has remained very light and very sweet, but the bulk of new production falls into the "light crude" category, with gravity in the range of 32-50° American Petro-leum Institute gravity (API). While each basin has its own profile, light condensate (at 58+° API) and heavy condensate (at 50-58°API) account for only about 15% of wellhead production in the key unconventional plays. 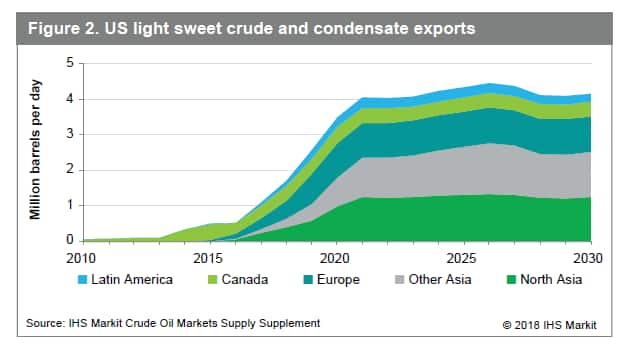 However, since much of the produced conden-sate is blended with other light crude streams for logistic and commercial reasons or moved to Canada for diluent use, the volume of segregated condensate available for overseas export is much lower than wellhead production. US refiners have continually adapted their crude slates to changing crude availabilities. Sweet crude runs fell steadily through the mid-2000s, while heavy runs ramped up as Mexico and Venezuela placed their growing production with US refiners. Heavy runs shifted toward Canada as Latin American availability faltered, keeping overall heavy crude runs roughly flat. As the unconventionals revolution spread, US refiners increased total runs and light crude runs in response to steep discounts for US production, and offshore imports fell to less than 30% of runs. Crude exports were allowed in phases, but all restrictions were removed at the beginning of 2015. US crude and condensate exports averaged 1.1 million b/d in 2017 and 1.5 million b/d in the first quarter of 2018. With the rest of the world welcoming US light crudes, exports are now moving to Canada, North Asia, South Asia, Europe, and South America (see Figure 2). China and India are becoming large importers of US crude, and the US will be one of the top five global crude exporters. US refiners will see strong coking economics, supporting crude imports and product exports From 2005 to 2015, global crude oil prices moved through a complete cycle, from the $40 range to well over $100 in 2011-2014, and then back down into the $40s.The cycle was interrupted only by the 2008-2009 financial crisis. However, refining profitability followed a more volatile and countercyclical path. From 2005 to 2008, the industry enjoyed a "golden age" of high margins and wide light-heavy spreads. The financial crisis initiated a steep decline, and margins improved only slowly through 2014, when the price collapse helped to trigger much stronger profitability in 2015-2017. 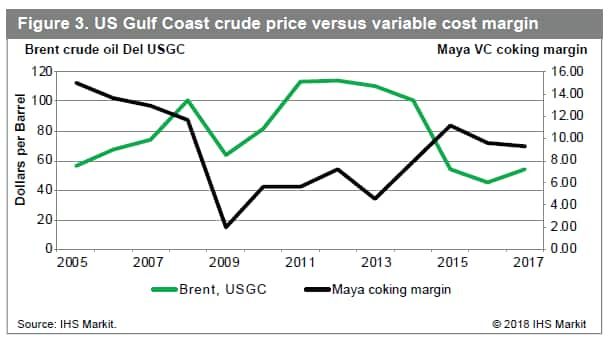 Figure 3 compares the international crude oil price to refining margins for Maya crude oil on the US Gulf Coast. Margins for processing US domestic sweet crude oils followed a very different path. 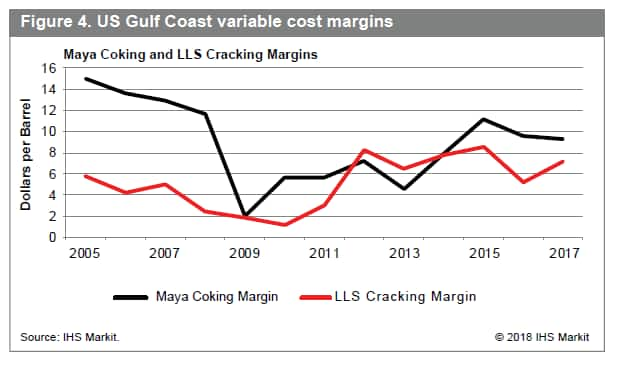 As shown in Figure 4, the variable cost margin for processing Light Louisi-ana Sweet (LLS) crude oil in cracking mode was far lower than Maya coking in 2005-2010; the margin then accelerated in 2011 and exceeded Maya margins through 2014. The lifting of the US export ban in 2015 resulted in higher prices for US crudes. As LLS prices moved toward export parity, margins declined to levels well below Maya coking; however, these margins were still quite strong relative to imported sweet crudes. The extraordinary profitability for domestic sweet crude processing created by the export ban is now gone, but US refiners still enjoy higher margins than European and Asian competitors, due in part to significantly lower energy costs. 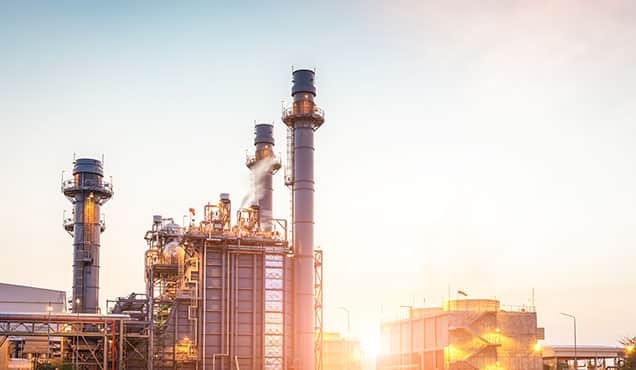 The combination of high complexity, low energy costs, and heavy crude supply from Canada and Latin America will maintain a strong position for US refiners. As a result, imports of heavy sour crudes will continue to flow into the US Gulf Coast. Global markets for light sweet crudes will sustain US export, causing those crudes to continue flowing out. Asian consumers will be the major source of export growth, as US light crudes will fit well into Asian refinery crude slates. 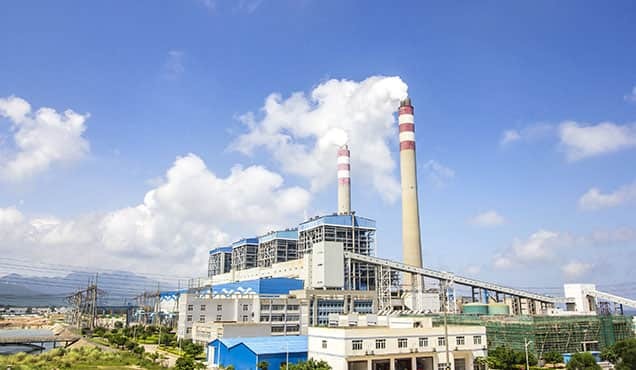 However, the relatively small contribution of heavy and light condensates to US unconventional production may disappoint some potential buyers, particularly petrochemical producers in North Asia. For those consumers, a strategy of naphtha exports combined with selective light crude purchases may be the best approach to meet their feedstock needs. Through its exports of crude oil, refined products, and NGLs, the US is now a large and growing presence in world energy supply. US unconventional production economics are strong, and they will drive growth in crude oil, gas, and NGL supply. Strong US refining margins will support growth in crude runs and refined product exports. 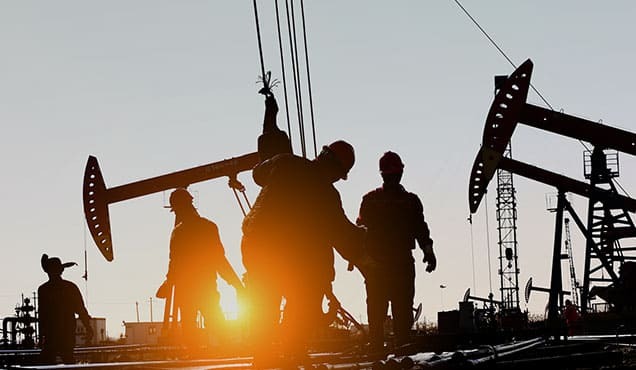 The US resource abundance and cost advantages will drive petrochemicals production as well as refining, helping cement the US position as a key global supplier of feedstocks, refined fuels, and petrochemicals.